[EN] If you don't hear from us in 24h, please contact us by email. Your message migh be lost. [ES] Si no recibe contestación pasadas 24h, por favor, contáctenos directamente por email. Su mensaje puede haberse perdido. Upon arrival in Lhasa you will be welcomed by your English-speaking Tibetan Guide and Tibetan Driver who will bring you to your hotel. Acclimatization to high altitude: please, drink lots of water and take plenty of rest in order to minimize altitude sickness. We begin visiting Jokhang Temple, the most sacred monastery in Tibet. It was founded in the 7th century by the first great Buddhist king Songtsen Gampo. Later you can explore the surrounding Barkhor old quarter and spend time walking around Jokhang Temple following pilgrims from all over the Tibetan plateau. 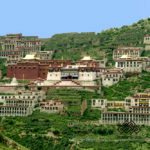 In the afternoon we go to Sera Monastery, one of three great universities of Gelugpa Sect. We will attend the debating session of the monks. Today we visit the beautiful Potala and Norbulingka Palaces. Potala winter palace was built in the 17th century by the fifth Dalai Lama. Provides amazing views of the entire city and houses the private quarters of the Dalai Lama, numerous grand state rooms and chapels. Norbulingka Palace is the summer palace of the Dalai Lama, built in the 18th century by the seventh Dalai Lama. It’s tradition to do picnic in its beatiful garden and perform opera dances during Shoton Festival (August-September). Adventure starts: we drive West to reach second largest city in Tibet. First we cross Kampa-la Pass [4797m] and then Karo-la Pass [5050m], where Mt. Noijin Kangsang [7206m] glacier lies near the road. 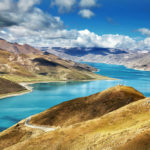 In the middle, we enjoy the unreal turquoise waters of holy lake Yamdrok-Tso. Then we stop in Gyantse town, where we visit the considered best tibetan art paintings in Kumbum Stupa inside Pelkor Chode Monastery. Also, we admire the majestic Gyantse Dzong (fortress) overlooking the valley. Finally, we reach Shigatse before dinner. The journey to New Tingri involves crossing the high pass of Gyatso La [5220m] and the opportunitty to view Mt. Everest and the Himalayas for the first time. Before, we visit Sakya Monastery which is is the principal seat of Sakyapa Sect founded in 1073 and one of four major Schools of Tibetan Buddhism. Its powerful abbots governed Tibet during the whole of the 13th century until they were eclipsed by the rise of the Gelukpa Sect. Its Mongolian architecture is different from that of temples in we seen before. Exciting day today: we reach one of the major highlights of our trip, Mt. Everest North Base Camp [5200m] (trekking or take bus). From New Tingri we continue driving towards Rongbuk Monastery, located at the foot of the Everest and the highest monastery in the world. We enjoy amazing views of several peaks like Makalu, Lhotse, Cho Oyu, and Mount Everest from the top of the Pang-la pass [5150m]. Overnight at tourist camp site located a few km after Rongbuk Monastery and from where we have direct views of Mt. Everest. Overnight at guesthouse tent (dorm bed without bathroom). Sleeping bag is recommended. After spending some time at the base of Mt. Everest we drive North West crossing high passes with enchanting views of the surrounding Himalayan peaks like Shishapangma and wild Peikutso lake. Today early morning we enter in the semi-nomadic regions of Tibet’s far west. We will enjoy the authentic Tibetan landscapes during this long drive journey through the biggest and highest plateau in the world. We follow Yarlung Tsampo river West (also called Brahmaputra in India) until the lake Manasarovar (Mapam Yumtso in tibetan language), one of the three most sacred lakes in Tibet. Hindus believe that whoever bathes in it will clean all their sins and provide good karma. Overnight at guesthouse (dorm bed without bathroom). Sleeping bag is recommended. In the morning we enjoy sunrise at the beatiful holy waters of Lake Manasarovar. After visiting Chiu monastery we drive to the little city of Darchen, at the foot Mount Kailash, where we will get ready for the trek. We begin the circumambulation of Mt. 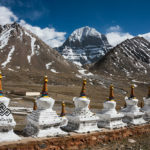 Kailash by going to an important pilgrimage area called Tarpoche. From here we begin the Pilgrimage Kora of Mount Kailash, most sacred mountain in Asia. Tibetans and Hindu people from all over the World come here for religious reasons. Overnight at guesthouse dorm bed without bathroom during trekking (2 nights). Sleeping bag is recommended. We have a long day drive along rough road where we will enjoy beautiful views of the unique landscapesuntil we finally reach the oasis town of Zanda. 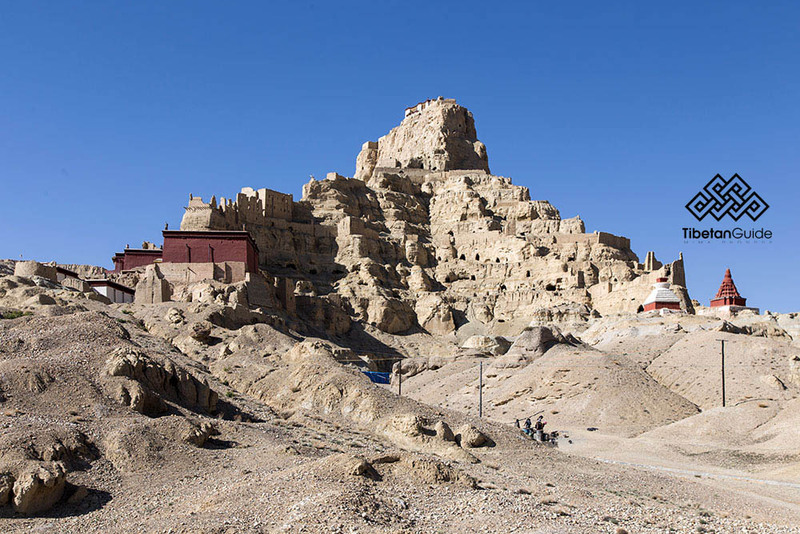 We explore Tholing monastery and Tsaparang citadelle. Tholing, which was once the most important monastic complex in western Tibet, is a awesome sight. Below stands the first capital of Guge whilst the skyline comprises a vast sweep of the Ladakh Himalaya. Guge’s later capital at Tsaparang is of even greater significance in the history of Buddhist art, its fantastic wall murals displaying evidence of close links with Ladakh and Kashmir. We will rediscover the cave dwellings, secret twisting paths tunnels linking the palaces. Days 13-14: Overnight at Zanda Hotel or similar in Zanda. Day 15: Overnight at guesthouse (dorm bed without bathroom). We drive East again through arid landscapes of sand dunes and wonderful views of the Himalaya Range. Day 17: Overnight at Gesar Hotel in Shigatse. We visit Tashilhunpo Monastery, built in the 15th century by the first Dalai Lama. Nowadays seat of the Panchen Lama. We recommend to do Kora around Tashilhunpo Monastery. Also, you can walk around local market. After we finish visits go back to Lhasa. Enjoy your last hours in Tibet exploring Lhasa by your own until your guide and driver meet you at the hotel to transfer you to the airport. 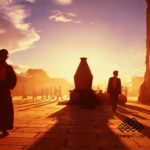 Consider extending your trip spending extra days in Lhasa city or surroundings. Like one-two more days visiting holy Namtso lake in North Lhasa (250Km, 4-5 hours drive, one way). Please, contact us for further information about any available extension of your trip. This is an original itinerary designed by us after many years of experience and excellence of our guides who have been leading hundreds of our now beloved friends from all over the world. Tour price for 4-12 people, 2850USD per person. – Single room occupancy supplement: 450USD. Rates shown above include all permits, english speaking tibetan guide, confortable accomodation, transportation and entrace fees ONLY. All our fixed departure tours for this itinerary start in Lhasa weekly. All participants are responsible for their own travel arrangements to Lhasa. We take care of all VISA process if coming from Nepal. The size of the group is between 4-12 people and the kind of transportation varies according to the size of it: minivan or minibus. 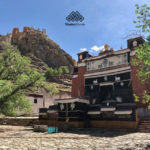 Hotel in Lhasa is Shambhala Palace / House of Shambhala in Barkhor area; outside Lhasa we selected best accomodadion available. ALWAYS in double room sharing basis with bathroom and breakfast, except Mt. Everest campsite tent, Manasarovar (Mapam Yumtso) lake and during Kailash Kora. Single room use available for additional fee. Please, contact us for further details. Please, check our upcoming departures. 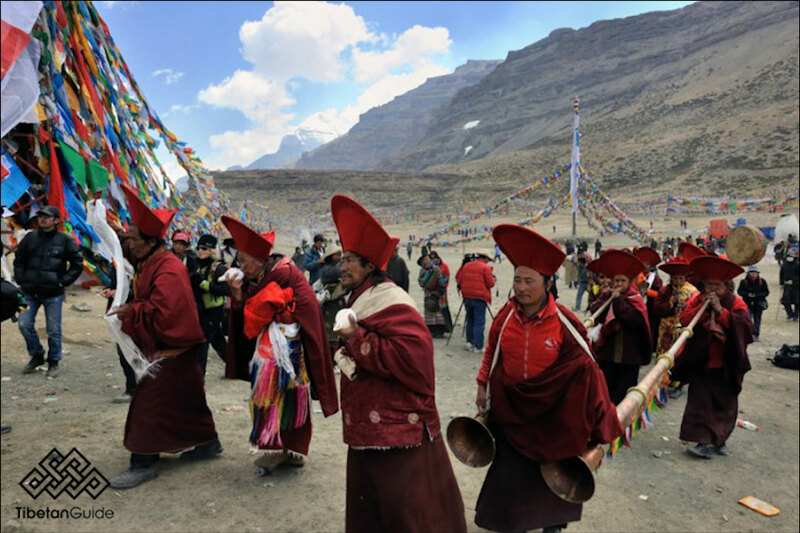 If you are planning to visit Tibet in late May / early June 2019, we highly encourage you to join this departure. Saga Dawa is celebrated on June 17th, 2019 at Mt. Kailash. This is a special moment to be there. As we do every year, we are organizing our most special trip for this big celebration, starting on June 8th. We do Kora during that time because its meaning for us. There will be lots of pilgrims. We celebrate birth, death and enlightment of Buddha and we all tibetans want to do Kora for a better next life. Yes, I want to assist to Saga Dawa Festival 2019 at Mt. Kailash. Price varies according to the number of people in your group, category of hotel, transportation and other services you request. Please contact us with these important details first.